Well, here's the part where I share some of my artwork with you. Of course, I have given away most all the art I've ever created, and never kept any copies because I never had the equipment to make a good copy. (Photocopies looked terrible!!). Now I do have scanners that can make a decent copy, so any further art I create, I'll put on the page, as appropriate. This image I created on 7/27/1997. It is 0.5mm HB mechanical pencil on Post-It. (It was a pink Post-It cube:) The original is 3 inches by 3 inches. It took over two hours and is not really complete. 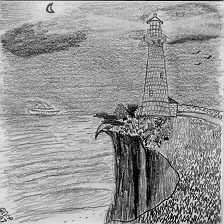 (Notice there's only vegetation near the lighthouse and it is sparse, and the ocean is not detailed). 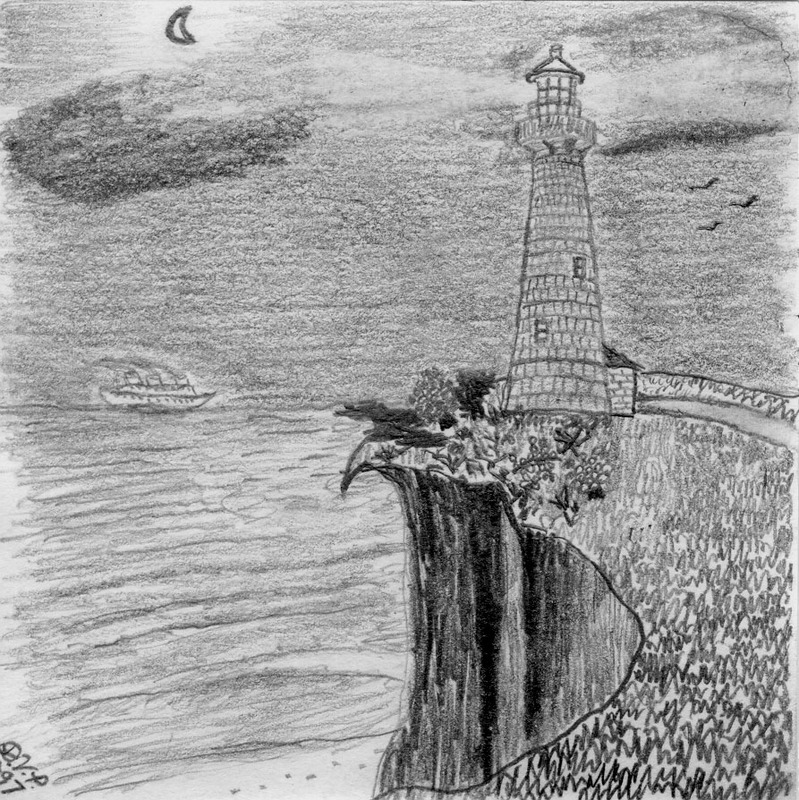 This image is scanned at 75dpi. If you click on it, you will get a 300dpi scan of the same image. This is a little snowman I sculpted on 10/9/1997. It is made from white FIMO, which was then baked in an oven to harden it to its present form. It is shown next to an 'AA' battery to show its size. These are some candles I made in January of 1998. The large two-tone candle was made from two pourings, one of clear wax, and the second of colored and scented wax. The full pouring takes about a half a dozen "filler" pourings to replace lost volume of wax as it cools and shrinks. Total tended casting time is about 6 hours plus final cooling. 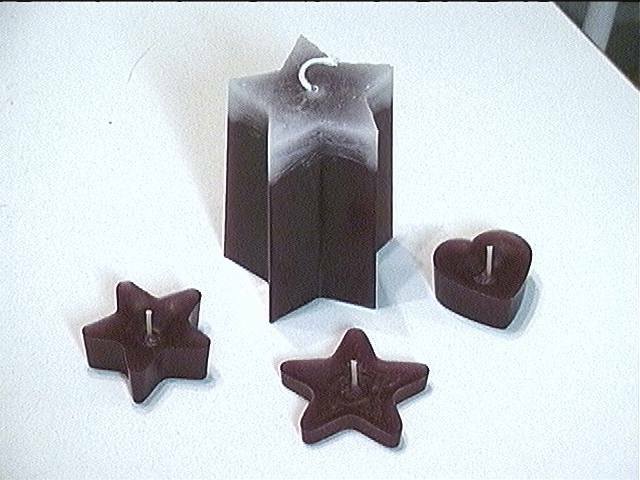 The smaller candles are "flash" castings made from the excess wax left over from the large candle. 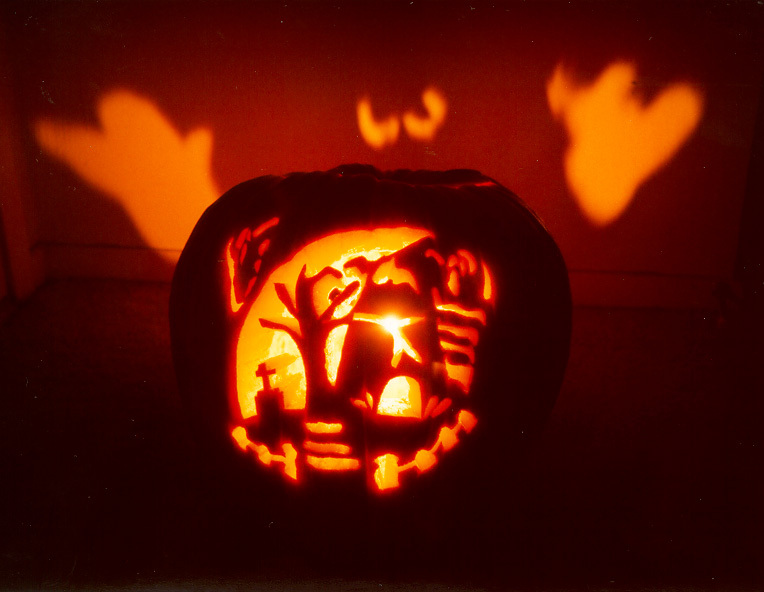 This is a Jack-O-Lantern I carved for Halloween of 1998. I titled it simply, "Graveyard" and it took 8 hours to carve. I drew the designs on paper, punched the pattern onto the pumpkin, then sawed out the details. I carved ghosts and eyes on the back of the pumpkin to make the floating ghosts and eyes images on the back wall. 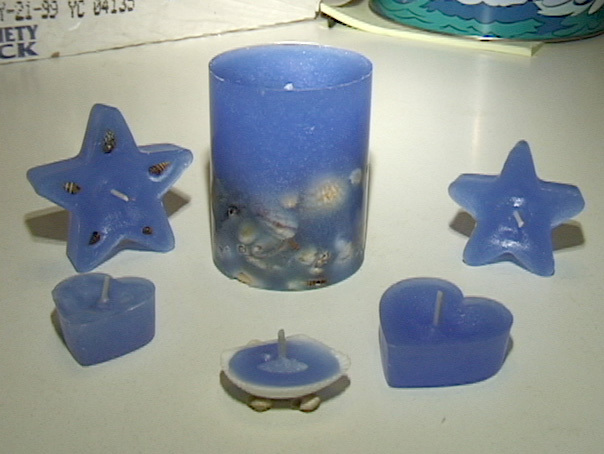 These are some candles I made in July of 1999. I had done some embedded items in candles, before. (Did some glass beads for Christmas). I thought these shells looked kind of nice, though.